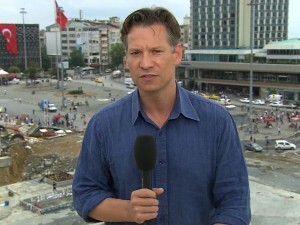 Image: Richard Engel, NBC’s chief foreign correspondent. In December 2012, Syria’s U.S.-backed “moderate” rebels pulled off a false-flag kidnapping and “rescue” of NBC’s chief foreign correspondent Richard Engel and his crew, getting the crime blamed on a militia tied to Syrian President Bashar al-Assad, a propaganda scam that NBC played along with despite having evidence of the truth. The Free Syrian Army has been the principal rebel force supported by the U.S. government which, in April 2013, several months after Engel’s high-profile ordeal, earmarked $123 million in aid to the group to carry out its war against Assad’s government. The other significance of the Syrian rebels’ successful false-flag kidnapping/rescue of Engel is that it may have encouraged them to sponsor other events that would be blamed on the Syrian government and excite the U.S. government and media to intervene militarily against Assad. On Aug. 21, 2013, a mysterious Sarin gas attack outside Damascus killed several hundred people, causing U.S. officials, journalists and human rights activists to immediately leap to the conclusion that Assad was responsible and that he had crossed President Barack Obama’s “red line” against the use of chemical weapons and thus deserved U.S. military retaliation. Within days, this political-media hysteria brought the United States to the verge of a sustained bombing campaign against the Syrian military before contrary evidence began emerging suggesting that extremist elements of the Syrian rebel force may have deployed the Sarin as a false-flag event. Obama pulled back at the last moment, infuriating America’s influential neoconservatives who had long put “regime change” in Syria near the top of their to-do list. In retrospect, the aborted U.S. bombing campaign, if carried out, might well have so devastated the Syrian military that the gates of Damascus would have fallen open to the two most powerful rebel armies, Al-Qaeda’s Nusra Front and the hyper-brutal Islamic State, meaning that the black flag of Islamic terrorism might have been raised over one of the Mideast’s most important capitals. The revelations about Engel’s staged kidnapping/rescue also illuminate the dangers of biased mainstream U.S. journalism in which the big news organizations take sides in a conflict overseas and shed even the pretense of professional objectivity. In the case of Syria, the major U.S. media put on blinders for many months to pretend that Assad was opposed by “moderate” rebels until it became impossible to deny that the dominant rebel forces were Al-Qaeda’s Nusra Front and the Islamic State. In late September 2013, many of the U.S.-backed, supposedly “moderate” rebels realigned themselves with Al-Qaeda’s affiliate. In the case of Engel’s staged kidnapping/rescue, the New York Times belatedly reexamined the case not in the context of a disinformation campaign designed to excite war against Syria’s Assad but as a follow-up to disclosures that NBC’s longtime anchor Brian Williams had exaggerated the danger he was in while covering the Iraq War in 2003 – explaining the story’s placement in the business section where such media articles often go. The most serious journalistic offense by NBC in this case appeared to be that it was aware of the behind-the-scenes reality – that individuals associated with the U.S.-backed rebels were likely responsible – but still let Engel go on the air to point the finger of blame in Assad’s direction. “group, known as the North Idlib Falcons Brigade, was led by two men, Azzo Qassab and Shukri Ajouj, who had a history of smuggling and other crimes. … NBC executives were informed of Mr. Ajouj and Mr. Qassab’s possible involvement during and after Mr. Engels’s captivity, according to current and former NBC employees and others who helped search for Mr. Engel, including political activists and security professionals. “Still, the network moved quickly to put Mr. Engel on the air with an account blaming Shiite captors and did not present the other possible version of events. … NBC’s own assessment during the kidnapping had focused on Mr. Qassab and Mr. Ajouj, according to a half-dozen people involved in the recovery effort. “NBC had received GPS data from the team’s emergency beacon that showed it had been held early in the abduction at a chicken farm widely known by local residents and other rebels to be controlled by the Sunni criminal group. “NBC had sent an Arab envoy into Syria to drive past the farm, according to three people involved in the efforts to locate Mr. Engel, and engaged in outreach to local commanders for help in obtaining the team’s release. These three people declined to be identified, citing safety considerations. “Ali Bakran, a rebel commander who assisted in the search, said in an interview that when he confronted Mr. Qassab and Mr. Ajouj with the GPS map, ‘Azzo and Shukri both acknowledged having the NBC reporters.’ Several rebels and others with detailed knowledge of the episode said that the safe release of NBC’s team was staged after consultation with rebel leaders when it became clear that holding them might imperil the rebel efforts to court Western support. “Abu Hassan, a local medic who is close to the rebel movement, and who was involved in seeking the team’s release, said that when the kidnappers realized that all the other rebels in the area were working to get the captives out, they decided to create a ruse to free them and blame the kidnapping on the Assad regime. ‘It was there that the play was completed,’ he said, speaking of the section of road Mr. Engel and the team were freed on. While it’s impossible to determine whether the successful scam about Engel’s kidnapping/rescue influenced the thinking of other Syrian rebels to sponsor a false-flag attack using Sarin, some of the same propaganda factors applied – with the U.S. news media jumping to conclusions about Assad’s responsibility for the Sarin deaths and then ridiculing any doubters. Yet, like the Engel kidnapping affair, there were immediate reasons to doubt the “group think” on the Sarin attack, especially since Assad had just invited United Nations inspectors to Syria to investigate what he claimed was an earlier use of chemical weapons by the rebels. As the inspectors were unpacking their bags in Damascus, the Sarin attack occurred in a Damascus suburb, a provocation that quickly forced the inspectors to address the new incident instead. Even as the evidence implicating the Syrian government evaporated, the mainstream U.S. news media and many wannabe important bloggers continued to defend the earlier “group think” on the Sarin attack and reject the possibility that the sainted rebels had done it. But the false-flag Engel kidnapping/rescue shows that such propaganda stunts were in the rebels’ bag of tricks.